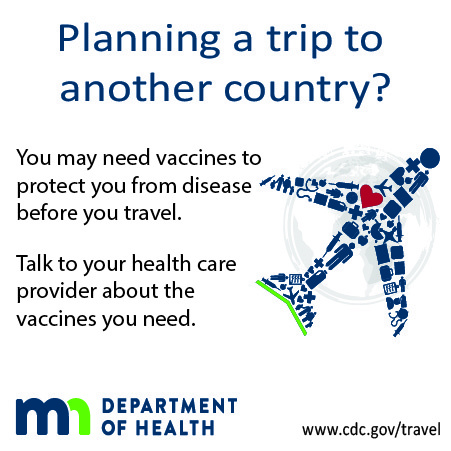 Photos by Bryan Thao Worra and Irina Stepanov, Ph.D. 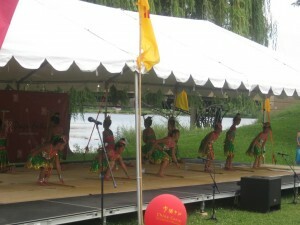 The Dragon Festival’s Phalen lake location and a string of good weather years has made it a highlight of summer. This past weekend it rained, and rained hard a the end of the event, but not until it had run its course for another successful year. The festival started activities earlier this year, with an early morning health walk around the lake, and a morning hip hop demonstration and competition on both days. The The Festival begins officially with an Awakening the Dragon ceremony, involving a long dragon dance procession by members of CAAM Chinese Dance Theater, with blessings by monks. A similar ceremony puts the dragon to sleep on Sunday evening. Her said the two-day event was a wonderful days and that people said they would be back again next year. 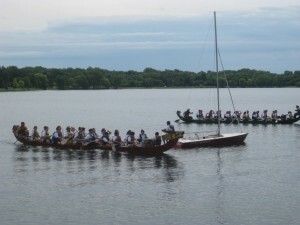 Much of the festival had concluded the time the rains came but there were still dragon boat races to run. “What a wild and wet finish this year,” said Yuan Roger Lee, chair of the Dragon Boat Race Committee. The Monkey Bay Paddling Club “Paddlers” came in first place. The Body Project came in second, and State Farm Insurance placed third. The Prospect Mortgage “Cliff’s Still Not Paddling” team won for Best T-Shirt. The Women of Buzzkill “Team Buzzkill” won for Best Spirit. Mississippi Watershed Management Organization/Golden Harvest Grocery/Ramsey-Washington Metro Watershed District/Capitol Region Watershed District “Clean Water Golden Dragon” won the Tug Of War event. Linda Hashimoto van Dooijeweert, the cultural entertainment chair, said the Dragon Festival is possible only because of volunteers that helped set up the stage and take it down. This year’s volunteers, coordinated by May Yang, were mostly Harding High School Japan Club members – some of who volunteered for the Festival of Nations Japanese food booth fundraiser to benefit the Dragon Festival. There were also individual volunteers and members of the Sansei Yonsei Kai Japanese dance group. Cultural Performances went on continuously and included several ethnic groups. There were children’s activities, an Asian Bazaar, cultural booths and food venders. There were martial arts demonstrations from Philippine Combat Arts; Twin Cities Gumbo; the U of M Judo Club; Master Gin Foon Mark Kung Fu; Dark Raven Studios; Kuk Soo Won; Kali Group; Green Dragon; Golden Leopard and Moving Chi. The Dragon Festival is a nonprofit organization with a mission to bring together the Greater Twin Cities community in celebration of the diverse Asian-Pacific cultures. The first festival was held 15 years ago at Hamline Park on N. Snelling Avenue, and was moved to the State Capitol grounds, and to the UniDale parking lot before moving to Phalen Lake in 2003. It has since become the largest pan-Asian event in the Twin Cities. 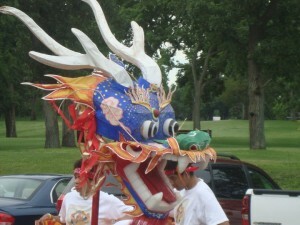 The next Dragon Festival will be held July 9 and 10, 2011. Find out more online at www.dragonfestival.org.